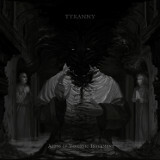 Finland's Tyranny has released some quite decent funeral doom in the past, with Lovecraft-themed, leviathan-sized songs that could provide a seriously depressive atmosphere. Now we have a new LP from them, the appropriately-named Aeons in Tectonic Interment. There were a few readers who criticized my categorization of Ahab's recent album as funeral doom, due to their progressive leanings in that album; for those who may want a traditional, uncontroversial funeral doom album that sticks to the genre's roots, this one will definitely fit the bill. Sunless Deluge starts with a sample of the door of a crypt opening and closing, as someone walks down a long flight of steps. Imagine the vocalist's vocal range at the very bottom of those steps -- no, wait...in a sub-basement of the bottom. Backing the deep croakings is a rhythm guitar riff with the approximate speed of continental drift, and a buzzing whine of a lead. Atmospheric sounds are contributed by a breathy keyboard, backed by a whispering sussurus of a voice; the last few minutes of the song start to speed up in a way that invokes a subtle sense of dread, as if a monster lurking in the crypt is drawing near, or a chanted prayer to Cthulhu is reaching its climax. A Voice Given Unto Ruin acts like a continuation of the first track, this time accented by high-pitched notes that sound like metal squealing against itself, as a demented-sounding choir sample breaks out partway through the track. The band uses samples a lot, and in ways that enhance the atmosphere; several of the songs, for instance, use long, drawn-out samples of screams, stretched out over the dreary lead and howling guitar feedback. I especially liked the use of feedback on The Stygian Enclave, where it moans over the crushing rhythm guitar to the point at which it sounds like some of those nuclear air-raid sirens of the 1950s. The final track, Bells of the Black Basilica, wasn't quite as interesting to me at first after the variation of The Stygian Enclave, but it gets substantially better. Its slow, grinding passage ends with bell-like guitar notes backed by what sounds a lot like an e-Bow, and the soloing is much stronger than in the previous songs, filled with regret and finality. Aeons in Tectonic Interment is a nicely solid and oppressive album with plenty of atmosphere, backed by excellent musicianship. I liked this one, especially the last couple of songs, and fans of Skepticism or (less so, though there's still a resemblance) Evoken will probably want to give this a listen.